Trump Is "Totally Willing" To Shutdown Government Until His Border Wall Is Funded (But Not By Mexico) - Joe.My.God. For the last two years, congressional Republicans have persuaded President Donald Trump to delay the fight to fund his border wall, convincing him he would pay a steep political price for such a high-stakes legislative brawl. Trump is done waiting. Nine days ahead of a deadline that could trigger a partial government shutdown, with no solution in sight, the president told POLITICO in a Tuesday Oval Office interview that he is unflinchingly firm Congress must send him a bill approving $5 billion for his wall on the U.S.-Mexico border, and said he would “totally be willing” to shut down the government if he doesn’t get it. 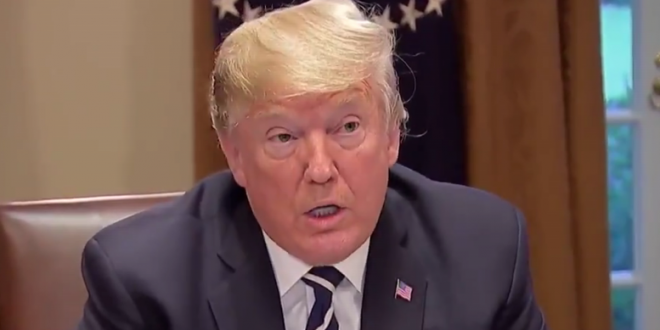 Sitting at the Resolute Desk in the Oval Office, with a stack of papers, magazines and a soda at the ready, Trump said he now believes that a pitched battle over the border is a “total winner” politically for his party, and a loser for Democrats. In the interview Trump repeated his lie that three Border Patrol agents were “seriously hurt” by rock-throwing migrants on Sunday.